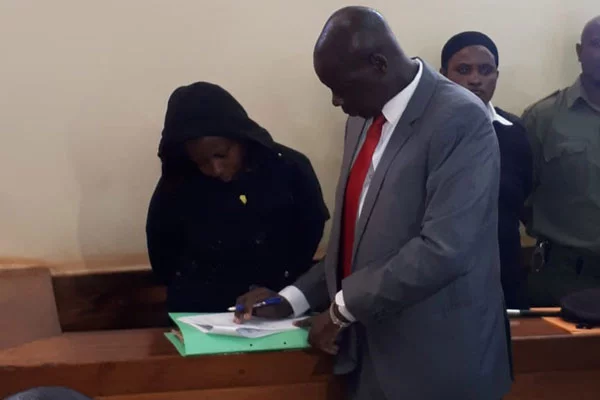 Home / Entertainment News / KATWA KIGEN reveals to the court how other inmates are treating Citizen TV's JACQUE MARIBE, tough times for this TV girl. KATWA KIGEN reveals to the court how other inmates are treating Citizen TV's JACQUE MARIBE, tough times for this TV girl. Monday, October 1, 2018 - Citizen TV’s anchor, Jacque Maribe, will spend more days behind bars after the Court denied her bail. The prosecution requested the Court to allow police to detain Maribe for 14 more days as investigations into the murder of Monica continue. Maribe’s lawyer, Katwa Kigen, opposed the prosecution’s request saying the “time requested for is unreasonable” and revealed how his client is being treated by other inmates at Gigiri Police Station. According to Kigen, the popular news anchor is being intimidated and mocked by other inmates at Gigiri Police Station, where she will spend 11 more days. Maribe was arrested on Saturday evening after detectives found key evidence that links her to Monica’s murder in her house. A handbag that belongs to the deceased and money in form of dollars stolen from Monica’s apartment after she was killed was recovered at Jacque Maribe’s house in Lang’ata. Detectives have been camping at Maribe’s house to collect more evidence. Jacque Maribe’s househelp told detectives that she was ordered to burn some clothes which allegedly belong to Jowi, Jacque’s fiance and the main suspect in the murder. The instructions came from Jacque Maribe, who is now a key suspect in the murder of Monica.